Have you got some gravy leftover? Don’t throw it out? Here are a whole bunch of ways to use it. 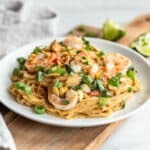 You’re totally going to find something for dinner tonight! One of the most popular posts on my website is about ways to use up leftover cranberry sauce. I figured that if so many people want to know about using up cranberry sauce, there must be something else from the holiday table that they’re also tempted to throw away because they don’t know what else to do with it. The something else I came up with is gravy. At this time of year I tend to do a lot of roasts and braises. These are always accompanied by gravy. Lots and lots and lots of gravy. I love the stuff. So much so that I spent time perfecting how to make it. Do check out my article on How to Make Gravy Perfectly Every Time to see how it gets done. With all that gravy going down, it’s true that I sometimes have too much. What happens? I put it in a container at the back of the fridge where it sits until I eventually throw it away. Yes, really. That’s what usually happens. Or that’s what used to happen. Today, I threw out one of those containers and decided that it would never happen again. That gravy is way to good to go to waste. Done. Freeze it: OK, this isn’t technically using it. But it’s keeping it until you can use it on one of the delicious dishes below. It freezes well in a air tight container. Keep it for up to 3 months. Meatballs: Make up a batch of these oven-baked meatballs but skip the gravy step and use your leftover gravy instead. Or make quick sausage meatballs like the ones in this soup to put into your gravy. Speaking of Soup: You can always add gravy to any soup. It’s going to give it a bit of body and lots of flavor. Get some broth going in a pot with some leftover meat and veggies. Then add in the gravy. It’ll spread out and be delicious. If you want some soup ideas to get you started, check out my 52+ Soups in Under 15 Minutes over here. Pasta Sauce: Gravy is fantastic as a pasta sauce. I especially love it on egg noodles. Think Stroganoff. One way to do it is to heat up your gravy and then swirl in some sour cream. Get your noodles under there and eat. I also really like a gravy-based sauce with sauteed mushrooms over gnocchi. That totally works too! Shepherd’s Pie: This is the thing to do if you have leftover mashed potatoes too. Fry up some ground meat and add your gravy. You want it well moistened but not soupy. Go in with some veggies (leftover ones or even frozen mixed vegetable swill do). Top with the leftover mashed potatoes and bake until heated through. Fries and Gravy: Where I come from in Central Canada, whenever you order fries they ask if you want gravy. It’s a standard question. “An order of fries please.” “Gravy” “Yes.” How to do it? Make fries. Put them on a plate. Top with hot gravy. If you’ve never had it before, to answer your other question, yes, you can still dip the fries in ketchup. You’re allowed. Try it and see what you think. Poutine: Have you had this? Have you heard of it? It’s insane. It’s a Canadian dish from the province of Quebec. You basically put hot french fries on a plate, top with cheese and then slosh on hot gravy. The cheese melts there between the gravy and the sauce and each bite is crazy. I have an example recipe over here. For it you make a special Buffalo Chicken Sauce. You can skip that sauce and just use your hot leftover gravy. Oh, and there’s a lazy version using baked potatoes over here. Newfoundland Fries: OK, so we Canadians like our fries and gravy. Clearly. Here’s another Canadian fry and gravy combo, this one coming from Newfoundland. What you do is put hot fries on a plate, top with leftover stuffing (here’s my go-to recipe) and then go in with all that hot gravy. If you’re thinking it sounds weird, it’s so not. Think about it. Your Thanksgiving dinner plate has potatoes, stuffing and gravy and you love getting it all onto one fork. This is the same thing but done with intention. And with French fries. Stew: It’s very simple to take your gravy, add leftover meat (or new cooked meat), vegetables and potatoes. If you don’t have enough gravy to justify a stew, you can make a basic sauce first. Get your meat and veggies into the pot with butter or oil. Sprinkle it all with flour, stir, then slowly add broth. Now you can add in your gravy and bring it all to a simmer. Get the amounts and instructions for the sauce base in this Alfredo Soup recipe. Hot Sandwiches: This is one of the best ways to use leftover gravy. Get out some good sliced bread. Top it with hot cooked meat (leftover roast chicken…mmmm) and then add your hot gravy. Dinner. Is. Served. Hot Sandwiches, Take 2: This is the way my husband likes it. Chop up the meat (and any leftover potatoes, stuffing, etc..) and mix it with the gravy. Heat it up and then spoon it onto nice bread. Salisbury Steaks: So retro and soooo good. Make or get yourself some burger patties. Cook them. Fry up onions. Stir the onions into your hot gravy and then pour it all onto the patties. Patty Melts (sort of): I worked as a waitress in my parents’ restaurants as a teen. This was my favorite thing to request for lunch when there. Grilled rye bread topped with a burger patty, topped with a slice of ham, topped with a slice of cheese, topped with gravy – all hot and melty and good. Chicken Pot Pie (or Any-Kind-Of-Meat Pot Pie): Chop up some cooked meat and add veggies. Go in with the gravy and then pop a pie crust over top. Bake. 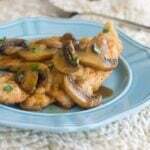 Here’s a recipe that will work perfectly, just use your gravy instead of the sauce listed in the ingredients. 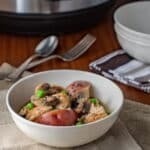 Chicken and Dumplings: Get some cooked chicken into a pot with a veg or two. Add your gravy and thin it out a bit with some water or milk. Heat it up and then cook dumplings in it. I don’t make the fluffy Southern-style dumplings. I tend to make ones that are somewhere between a dumpling and spaetzle. Here’s my dumpling recipe. Biscuits and Gravy: Cook up some breakfast sausage meat. Add your gravy. You probably want to add a dash or two of hot sauce or some black pepper because sausage gravy usually has a kick to it. Spilt open some hot biscuits and ladle on the gravy. Chicken Fried Steak: This is often served with gravy on top. As with the Biscuits and Gravy idea above, you’ll want to add a touch of heat with either hot sauce or black pepper. Hamburger Hash: The way I usually make hamburger hash is to cook up ground beef, add flour, stir, then add milk. It’s a saucy thing. Skip the flour and milk and go with gravy instead. Serve over noodles or potatoes. Curries: If you’re not in the mood for the classic American comfort food, you can take a totally different spin. Add some coconut milk and curry powder or curry paste to your gravy. Add some chicken and cauliflower, maybe some chick peas. Serve with rice and naan bread. Beef Dips: A true beef dip is served with au jus (the more transluscent drippings from a roast). But swapping that out for a gravy dip is definitely an option. Eggs Benny, Kinda: English muffin, ham, poached egg, gravy. Trust me. It works. Leftovers: Why fuss with all that other stuff? 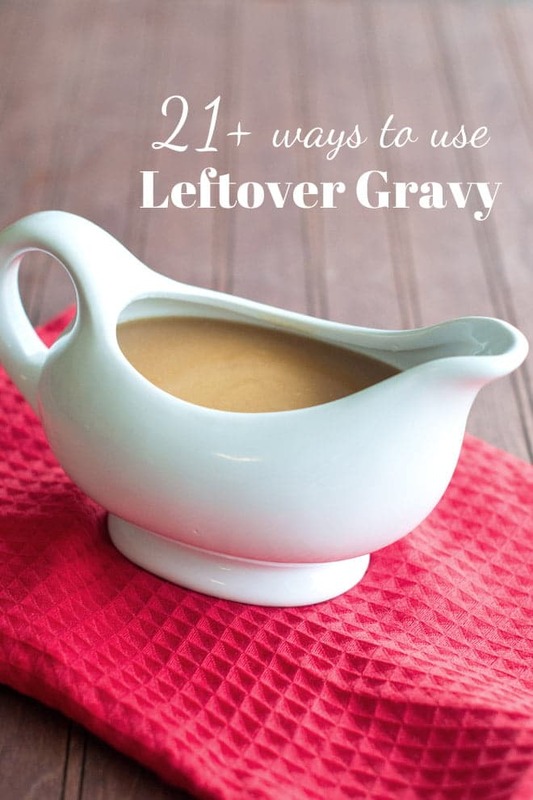 If you have leftover gravy, maybe you have leftover other stuff too. Pile it all onto your plate, top it with gravy and microwave till hot. I’ve taken leftover gravy, thinned it out with water, and then cooked rice in them. Thanks, Samantha. Gravy is great just on bread too! Such a sensible list, do’able without too much fuss. Thank you from the UK. You could also make Egg Foo Young. Either make it the traditional Chinese Take-Out way, or you could add anything you’d normally put in an omelette. Or not! I made one that was pretty delicious with green onions, leftover boiled potatoes, green beans, and some ground beef I seasoned with some garlic, salt, and pepper. Then, the gravy on top really brings it all together. Robert, that sounds amazing! Great idea! These were wonderful ideas, simple and useful, Thankyou. Newfoundlander here! Can’t believe “Newfoundland” fries made your list. Lol seems so random and obvious. Meatballs and gravy on fries is another common thing here. And melting mozzarella curds on top of fries with dressing and gravy, in other words, poutine with dressing. Great with crispy fried battered cod; aka poutine fish n chips! These are so brilliant!! I hate throwing out good gravy!